Dr. Omar Abbasi is a specialist in the medical and surgical treatment of glaucoma . A Michigan native, he graduated with honors from the University of Michigan and received his medical degree from the University of Michigan Medical School. 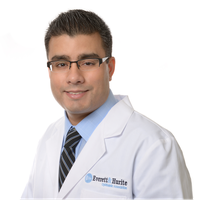 Dr. Abbasi completed his ophthalmology residency at the Kresge Eye Institute in Detroit, Michigan, where he was elected as chief resident his final year. He then trained under renowned glaucoma specialist Dr. Michael Kass at the Washington University Eye Center in Saint Louis, Missouri, where he completed a fellowship in glaucoma and anterior segment surgery. Dr. Abbasi has extensive experience with glaucoma lasers including both argon and selective laser trabeculoplasty (ALT and SLT), and endocyclophotocoagulation (ECP). He performs trabeculectomies, as well as the placement of ExPRESS mini-shunts and glaucoma drainage implants. Dr. Abbasi also is available for general eye care and consultation. He sees patients at his Pittsburgh, Greensburg, Monroeville, McMurray, Rostraver and Wheeling locations.